Homes that use steam boilers to provide heat need yearly service to ensure the longevity of the system and to maintain the overall value of the home. 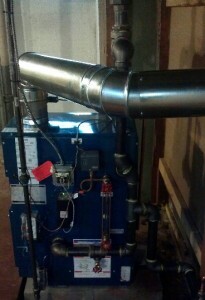 At Efficient Heating and Cooling, we offer some of the finest heating solutions in the business. We go beyond servicing the equipment and take a thorough look at how the entire system is functioning within your home. Our goal is to provide excellent service and support for lasting performance. For well over 100 years, Weil-McLain has designed and manufactured hydronic heating systems for residential, commercial and institutional buildings. Our technicians are able to service and repair all types of Weil-McLain hydronic heating system. Dunkirk provides innovative, efficient and dependable home heating products. Their product line includes hot water boilers, steam boilers, indirect water heaters and a variety of HVAC products. Contact us for more information about Dunkrik products. Triangle Tube can be found in a variety of residential, commercial and industrial applications. They offer a complete line of stainless steel hot water heating products. Each of which is carefully designed for peak performance and low ownership cost. Contact us for more information about Triangle Tube products. For more information about steam boiler repairs, give us a call at 216-663-6462!